What do we need? The start of a new season, brilliant, exciting and rich of events. 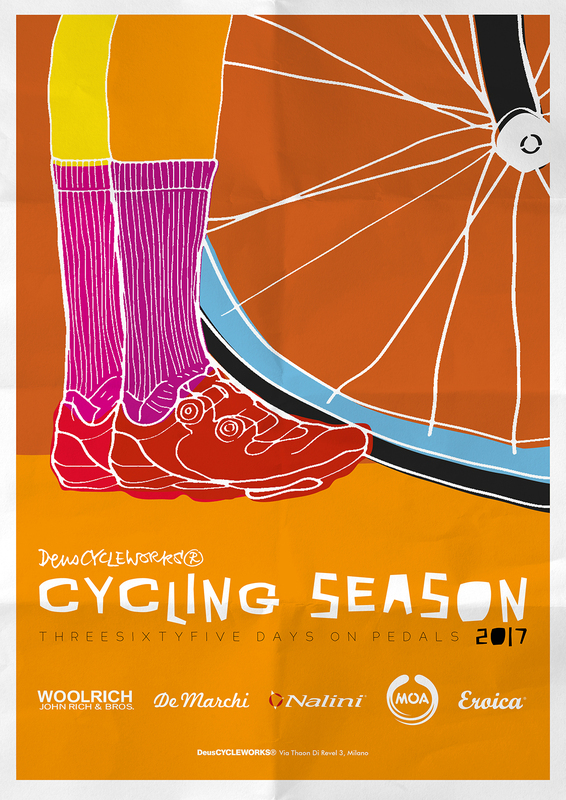 For this reason, we have scheduled a Cycling Season 2017 Calendar, that will allow all the fans to not miss the numerous appointments that fill the months of this new season. Absolute protagonist: the bicycle. The dates of the classic cycling races that have made history of this sport, followed by the great audience, are undisputed attendance. We also colored the calendar with the dates of the events to which we will participate with our team Deus Cycleworks. Cyclocross championships, randonee, road races … and more. Last year we thought about it, this one we have done it: Deus Cycleworks will participate to all the Eroica in the world, thanks to the precious support of L’Eroica srl. It will be a challenge, with a vintage style and a good taste that only healthy companies give. The historical brand of clothing for cycling, De Marchi, will welcome us to the famous “Ciclostorica Emilio De Marchi”, when the Deus Cycleworks Jerseys, borned from the collaboration between the two companies, will parade. 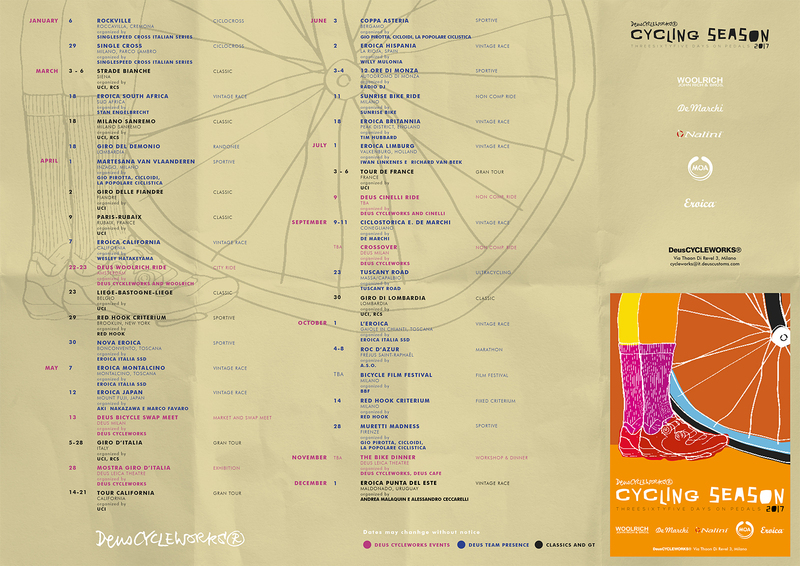 Spectators, actors and from this year also directors of events made in Deus Cycleworks! Deus Woolrich Ride, 22nd-23rd April. With the famous clothing brand, we have created a pedal assisted bike, Deus X Woolrich e-bike, which, with elegance, will cross the streets of Amsterdam, the city that will welcome this trip on wheelers. Deus Cinelli Ride, 9th July. The friendship that binds us from years to the historical brand Cinelli, has led us to achieve many projects together. This year we will take you to a unique location to ride together on the best bikes and to finish in style with a classic bread and salame! Deus Bicycle Swap, 13th May. An exchange market at the Deus Temple in Milano, for all those who want to sell or buy components and bikes! An event open to all, with a dedicated area for exhibition of vintage parts and one dedicated to the exchange of bikes. A day full of fun, moved by a live concert, a BMX live show… and good food! Giro d’Italia Exhibition, 28th May. In occasion of the Giro d’Italia and his arrival to the Duomo of Milano, Deus Cycleworks turns pink. We will reserve an exhibition space to the history of cycling and to his great champions. With the support of the Cycling Museum of the “Madonna del Ghisallo” we should expose historical shirts, bikes and memorabilia that have made the history of this sport. Deus Cycleworks Crossover, September. The first cycling event, open to bicycles of all types: gravel, mountain bike, road, vintage, and “inappropriate” (from Graziella to Saltafoss). The “moving” event includes navigation and regularity tests on and off road trails, unique locations, spectacular landscapes rich in charm and dust. Every rider will be welcome. A dedicated kit will be created for this event, with the support of Nalini, the famous company of technical cycling clothing. The Deus Cycleworks Team with his parteners will waiting for you also this year to share new adventures with the same passion! Di cosa c’è bisogno? Dell’inizio di una nuova stagione, brillante, entusiasmante e ricca di eventi. 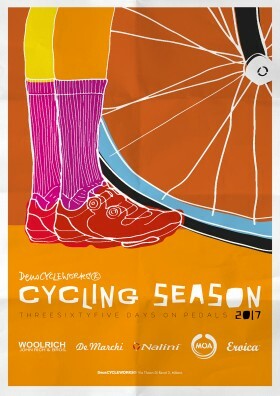 Per questo abbiamo redatto un calendario del ciclista CYCLING SEASON 2017 che consentirà a tutti gli appassionati di non perdersi nemmeno uno dei numerosi appuntamenti che affollano i mesi di questa nuova stagione. Protagonista assoluta: la bicicletta. Presenze indiscusse le date delle classiche corse ciclistiche che hanno fatto la storia di questo sport e seguite dal grande pubblico. Inoltre abbiamo colorato il calendario con le date relative agli eventi a cui parteciperemo con il nostro Team Deus Cycleworks. Campionati di ciclocross, randonee, gare su strada…e non solo. L’anno scorso l’abbiamo pensata, quest’anno l’abbiamo realizzata: Deus Cycleworks parteciperà a tutte le Eroiche nel mondo, grazie al prezioso supporto di L’Eroica s.r.l. Una bella sfida, dallo stile vintage e dal buon sapore che solo le sane imprese sanno dare. Lo storico marchio di abbigliamento per il ciclismo, De Marchi, ci accoglierà alla famosa ciclostorica Emilio De Marchi, dove sfileranno le maglie Deus Cycleworks nate dalla collaborazione delle due aziende. 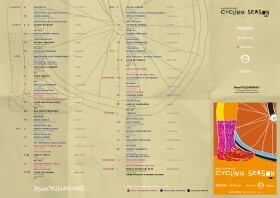 Spettatori, attori e da quest’anno anche registi di eventi made in Deus Cycleworks! Deus Woolrich Ride, 22-23 Aprile. Con il noto brand di abbigliamento abbiamo creato delle bici a pedalata assistita, le Deus X Woolrich e-bike, che attraverseranno con eleganza le strade di Amsterdam, città che accoglierà questa trasferta sulle dueruote. Deus Cinelli Ride, 9 luglio. L’amicizia che ci lega da anni allo storico brand Cinelli ci ha portato a realizzare insieme numerosi progetti. Quest’anno vi porteremo in una location unica per pedalare insieme in sella alle migliori bici disponibili per finire in bellezza con un classico pane e salame! Deus Bicycle Swap, 13 maggio. Un mercatino di scambio in Deus, per tutti coloro che vogliono vendere o comprare componenti ed accessori bici! Un evento aperto a tutti dove i partecipanti avranno a disposizione una zona dedicata all’esposizione dei loro pezzi usati ed una zona dedicata allo scambio di bici. Una giornata ricca di divertimento, movimentata da un concerto live, uno spettacolo di bmx…e buon cibo! Mostra Giro d’Italia, 28 maggio. In occasione del Giro d’Italia ed in concomitanza del suo arrivo al Duomo di Milano, Deus Cycleworks si tingerà di rosa. Riserveremo uno spazio espositivo dedicato alla storia del ciclismo ed ai suoi grandi campioni. Con il patrocinio del Museo del ciclismo della Madonna del Ghisallo, saranno esposte maglie storiche, bici e cimeli che hanno fatto la storia di questo sport. Deus Cycleworks Crossover, settembre. Il primo evento ciclistico, aperto a bicilette di tutti i tipi, gravel, mountain bike, strada, vintage e “inappropriate” (dalla graziella alla saltafoss). L’evento “in movimento” prevede prove di navigazione e regolarità su percorsi On e Off road, location uniche, paesaggi spettacolari ricchi di fascino e polvere. Ogni ciclista sarà il benvenuto. Verrà prodotto un kit dedicato a questo evento creato grazie al supporto di Nalini, famosa azienda di abbigliamento tecnico per il ciclismo. Il Team Deus Cycleworks con i suoi partener vi aspetta per condividere anche quest’anno nuove avventure con la stessa passione!